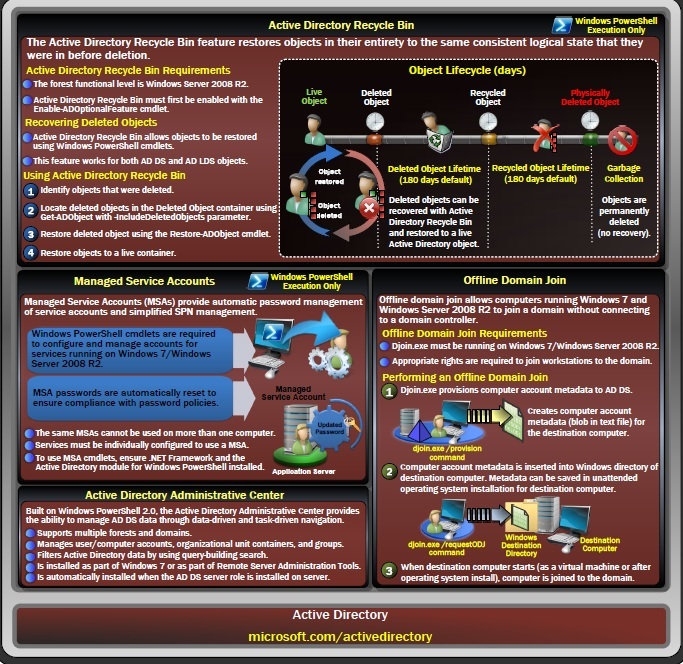 This poster provides a visual reference for understanding key technologies in Windows Server 2008 R2. To download click here. For additional information and documentation about AD, check this link. This is an issue that we originally talked about a while back but we’re still seeing some cases come in so I thought it would be worth another mention just in case. An internal error has occurred trying to contact an agent on the %serverName%. Ensure that the agent is installed and running. Ensure the WS-Management service is installed and running, then restart the agent. This issue is caused by a problem with the Host certificate (incorrect name, IP instead of FQDN or NetBIOS) or the certificate is missing from the VMM server. Now we need to locate and delete any certificates for the Host computer. Open the Certificate console on the SCVMM server. a. Open a new mmc and add the certificates snap-in. b. Select the option of ‘computer account’ and ‘local computer’. c. Select Finish and Ok to load the snap-in. The certificates for the Host computer can be in any of the following locations. b. Trusted People (if the host is W2K8). c. Trusted Root Authorities (If the host is W2K3). In each store, expand the Friendly Name field and locate the certificate[s] for the Host server that have a Friendly Name starting with ‘SCVMM_CERTIFICATE_KEY_CONTAINER‘ followed by either the FQDN / IP address / NetBIOS name of the Host server and delete them. Re-add the host in SCVMM which recreates the certificates as needed. SCVMM uses BITS to transfer payload between SCVMM managed computers. These data transfers are encrypted by using a self-signed certificate generated at the time a host machine is added to VMM. If these certificates are missing or corrupted from the VMM server or managed computers, the payload deployment job can fail. Deleting the certificates and re-adding the host will cause the certificates to regenerate. Today we decided to apply the System Center Virtual Machine Manager 2008 R2 Rollup Package . VMM01 is not a valid network computer name. Only fully qualified domain names and NETBIOS computer names are valid. An IP address is valid only for hosts on a perimeter network, ESX hosts, and hosts joined to the domain by using an IPv6 address. Check the computer name, and try the operation again. What!!! VMM01 is our SCVMM R2 computer name??!!! From the error description appears to be a problem with name resolution process!!! Note that in the previous screen the “Update agent” operation was performed by a user with local Administration permissions on both Server and VMM. After that the VMM server “tries” to refresh the physical host but the process fails with error (2910) using the VMM service account??!!! 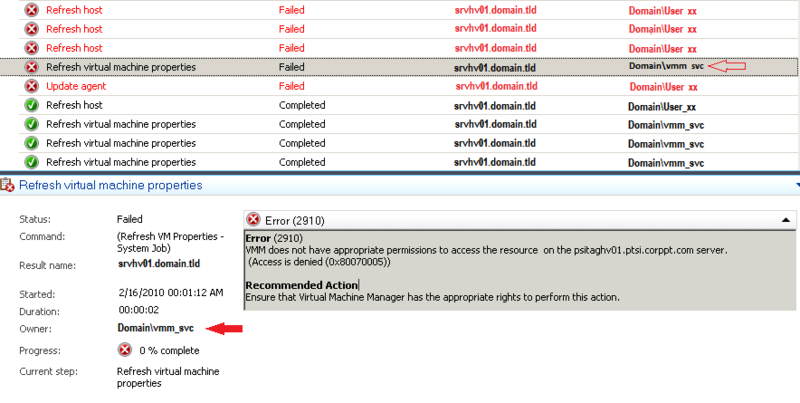 VMM does not have appropriate permissions to access the resource on the srvhv01.domain.tld server. Great!!! Nice!!! 😦 – Note, before agent update we can see that no errors occur in refresh process, either using the domain account that we used to update the agent nor using the VMM service account!!! Weird 😦 – Let’s try to remove the Physical host and re-add it again!!! VMM does not have appropriate permissions to access the resource C:\Windows\system32\qmgr.dll on the srvhv01.domain.tld server. VMM does not have appropriate permissions to access the resource D:\VMs\SRVVM015\Hdd01.vhd on the srvhv02.domain.tld server. Note the previous screen that is saying “VMM does not have permissions for the VHD file for SRVVM015 in srvhv02“?!! WHAT!!! The SRVVM015 IS NOT hosted in SRVHV02!! This VM is hosted on SRVHV10, what #!#”#@#@#@#@#&#*#kc!!!! VMM does not have appropriate permissions to access the resource \\vmm01.domain.tld\MSSCVMMLibrary2 on the srvhv01.domain.tld server. In our scenario we need to fix several things before make this all work again. 1 – We had to add the Physical hosts (Name and IP) to the local hosts file in VMM (This process was done only for a few hosts, there’s a possibility that in fact we do have a name resolution problem with specific hosts). 2 – We need to fix the security permissions in the Physical hosts. We need to add the service account of VMM to the “Virtual Machine Manager Servers” and to local administrators security group. 3 – We need to fix the permissions in the VMM shares, yep, those were all missing as well 😦 – We notice this problem when we uninstall the agent on the Physical hosts and from VMM server. When we tried to add the host to VMM server again we got an error telling us that the permissions for the VMM share were missing. 4 – In some hosts (For hosts in DMZ this is mandatory) we had to remove the physical host from the VMM server, uninstall the VMM agent, and then re-add them again after we did all previous steps mentioned before.